Dark Star. Jack H. Harris Productions/University of Southern California 1974. This movie is selling itself to me hard as a comedy, and I see the potential, but it’s working so hard on that that I don’t have much else to go on but the genre. Apparently the main plot concerns a planet-destroying bomb stuck in a colony scouting ship that gets delusional and considers exploding in the hold. Like I said, not much to go on. It sounded like a fun movie, and one I’d probably have a lot to say about, but leaves me even more uninspired than usual in this section. Bearing in mind that it’s a student film, but one of high acclaim and penned by some famous names in sci-fi, this could get interesting. 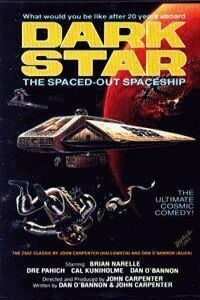 Long into their mission, the crew of the colony scouting ship Dark Star are responsible for going into deep space, finding planets in unstable orbits in star systems otherwise ripe for colonizing, and destroying them with intelligent planet-killing bombs. Their ship keeps having malfunctions, sometimes humorous (one of the storage bays blew up, taking their entire stock of toilet paper), sometimes life-threatening. Bomb #20 keeps receiving errant deploy messages, ultimately causing it to get fed up with silly things like safety and overrides, resulting in the finale that is the only part anyone seems to talk about. This felt much more like the kind of student film I’m used to seeing/working on. Several sequences seem to only be there to show off the effects they can do or figure out those effects, which is fine for a student film, but makes for a rather dull story. Even so, it doesn’t seem so much to me like a story as a series of somewhat related events occasionally contributing to a foreshadowed conclusion. The dialogue was delivered in a slow and occasionally stiff manner, especially when the editing was responsible for the pacing, or when a voiceover character (there are three or four, depending on if Bombs 19 and 20 count as one or two) is involved in the conversation. The visual effects, however, are mostly pretty good for the times and budget (reportedly $60,000), and the sets and costumes and such are fairly well done, though obvious random items sometimes show up, like the muffin tin on a spacesuit’s chest. On the other hand, the alien beach ball-like pet gremlin, which seems to not so much be mischievous as “evil in a way that is supposed to play as cute” looks exactly like what it is, a painted beach ball with claw feet. The humor the DVD case wouldn’t stop talking about long enough to describe the story? There’s a small joke here and there, and exactly three sequences that are pretty funny (the elevator shaft, talking philosophy with Bomb 20, and the very end), but overall, it’s a long string of broken dialogue and effects telling the story of a broken-down ship and a crew at each other’s throats, which sounds like it should be funnier and/or more dramatic than it was. Watch this movie: If you’re a John Carpenter fan, or like existential warheads. Don’t watch this movie: If you’re in the mood for a laugh riot.